Imagine what would happen if McDonalds and Burger King shared recipes and business models, or if Comcast and Verizon viewed each other as allies in their efforts to bring cable and high-speed internet to everyone. In a capitalistic society, where competition is branded as the best way to keep prices low and the customer happy, openness and collaboration can work against your business interests. Why give away your advantages? Enter coworking. The values of coworking are openness, collaboration, accessibility, sustainability, and community. These qualities may seem to fly in the face of capitalism. Why should we share? How can my business thrive if someone else is diluting my presence in the marketplace by offering the same services? 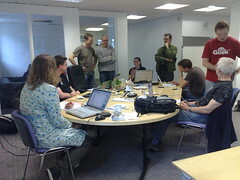 The Coworking Wiki was formed as a way to grow the movement and share our values. It’s a free, community-owned and operated web tool meant to help anyone looking to start, find, and run a coworking space. It offers shared business plans and advice. It has links to well-researched press about the movement. It showcases collaborative efforts between spaces, like the Coworking Visa program, which allows a freelancer or small business entrepreneur the use of an office while traveling in another city. The wiki allows us to aggregate and organize all of these resources in one place while reviewing its content and ensuring its neutrality. Today it is one of the top 3 web search results for “coworking” (behind Wikipedia and coworking.com). It’s highly visible, averaging about 500 hits a day, and it’s often one of the first places people new to coworking will go to learn about the movement. But there’s a problem . . .
Until now, the wiki’s content has been moderated by a small group of dedicated volunteers. The movement has grown exponentially, and the demands of keeping the wiki organized and up-to-date have simply become too much for the same level of commitment. Many links on the wiki are broken or misleading. Section heads are missing content, and contact information is outdated. Many wiki visitors feel overwhelmed or lost. It doesn’t have to be this way. The wiki has amazing potential to help new space catalysts, owners, and bring new people to the movement, and we want to help it live up to that promise. A small team of Seattle-based coordinators are working on a plan to improve the wiki’s content while creating a framework to keep it organized and maintained long into the future. We’ve identified the wiki’s key stakeholders, and we want to restructure the site using the concerns of these groups as a guide. We are working for discounted rates and volunteering our time in order to make this happen, but we can’t do it alone. Are you great an organizing and consolidating information? Maybe you’re more of a people-person. Our volunteer coordinator, Sarah Cox of Cospace, is assembling a list of is coordinating wiki volunteers and would love to hear from you if you have some time to chip in. Going forward, the wiki will be moderated and organized by small team of coworking space employees. Their work on the project will become part of their regular job functions (no overtime necessary), and we expect wiki obligations to occupy no longer than 5 hours/week. We are looking for at least 3 more team members willing to make a one-year commitment. If you are an employee of a coworking space, or run a coworking space and are willing to dedicate up to 5 hours/week of your paid time to the project, we’d love to talk to you about joining the effort. Your contributions allow for the recruitment and training of new team members, community outreach efforts, and the development of a map-based, searchable Coworking Directory. Our passionate team is fully committed to seeing this through, and they can’t do it without your financial support. Please think about how you could benefit from the shared resources of an upgraded Coworking Wiki and, if you’re able, consider making a contribution. First and foremost in our minds is that this is a community project. Please subscribe to our blog or follow us on twitter. Track our progress, share this information with other community members, and don’t hesitate to let us know what you think. We have been making great progress cleaning up the coworking wiki and eradicating spam. The first step is to start a moderator group that approves/denies people who would like to make edits. This is a pretty easy step as folks who are not interested in coworking and only want to add links and such generally don’t try very hard. 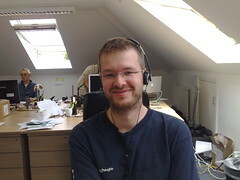 Will Bennis from Locus Workspace in Prague personally writes everyone who doesn’t include a message in their sign up request and only one in four write him back. We also keep a close eye on the changes RSS feed and jump in and clean house when someone mucks things up. The space listing has been cleaned up too and moved into a specific Directory page. We have also kicked off The Coworking Database Project aimed at creating better searching functionality. The end result will be a fully decoupled data set with APIs to hook into various interfaces around the net. For example, imagine the data behind Coworking in Deutschland was centralized and they were able to pull just the German spaces to power their list and map. If you would like to get involved in that project we have a mailing we use for collaboration and it’s all listed on the project splash page. If you are interested in helping out with the wiki cleanup work, or would like to make suggestions, just drop me a line at jacob [at] officenomads [dot] com. The Werks is a coworking space in Brighton & Hove (UK). It launched in January 2008 with a challenge of filling up over 6,000 sq ft of creative space – a mixture of open plan desk & coworking space, enclosed office space and the events space. There are 3 of us behind the project and has been entirely self funded (time and money wise). We have discovered that whilst it is a lot of hard work it is really rewarding to see it come together. The excitement of people’s faces is worth all the blood, sweat and tears that comes with trying to make it all work. The Werks has and is all about community, where we hope it will be the best local hub – where anyone can really participate. Open Coworking every Friday has proven so popular that we have opened it up to every day of the week. Very popular with the community is the range of free and low cost events (educational and social) that we or community members organise, these give people the opportunity to sample what we are all about and to participate in a variety of different ways. It’s not a complete surprise, but are we finding that our open and transparent approach is the best marketing tool. People are talking about us, making recommendations, coming to open coworking and events and feeling the positive vibe going on. It is because of this that we are pretty close to full capacity. We are only at the beginning of our journey and very much looking forward to the future. Hi everybody, just wanted to introduce our brand new little coworking project, here in Milano: [email protected] monkeybusiness. First of all I’d like to say that the work thas been done and shared on this blog and related wiki has been fundamental for us, so… thanks guys! We’ve been officially opened for 10 days now, and we have no coworkers in house yet. This may sound like bad news but actually we’ve started completely out of the blue, so it’s kind of expected to have a warm-up period, I guess. Our space is a 140 sqm loft on two levels (pictures here) located in the eastern part of the city, towards Linate airport. The neighborhood is being totally gentrified, being – in the past 20 years – an industrial district. Used to be blue collar environment, now it’s becoming student-artistic-media kind of thing. But still, for now at least, we enjoy the good sides of city borders, i. e. parking with no charge, not-as-much traffic congestions and… my house is at walking distance! In these first days of Cowo, my wife + partner Laura and myself are mostly concerned with understanding the market need of a coworking place in Milano (as far as we know, we’re the only ones – speaking of cw, desks to rent you can find many), something that we’ll discover in the near future. The people who showed interest, up to now, have been very different, ranging from the freelance art director to the sailing boat designer, from a group of architects to pr professionals and code writers. They all seemed fine people and we enjoyed meeting them. We did notice that our place seem to rise interest in small groups, which brings up the price issue. What else? Oh, what we do for a living! We’re a creative consultancy for advertising, called Monkey Business, the three of us include a copywriting dude (me) with two supertalented art directors, that make look great whatever crap comes out from my mac. Check out our smiling logo and you’ll see what I mean! Last but not least, we have enjoyed a good blogosphere attention thanks to the announcements made by the Italian Art Directors Club blog and the much-followed creative free-lance blog, BolleBlu. So, next time you’re in town, please come and visit us: cowo @monkeybusiness via ventura 3 milano 20134 [email protected]… we’ll share pizza e birra to begin with! Author Massimo CarraroPosted on April 10, 2008 March 14, 2016 Categories Coworking, Getting involved, In Progress, Of interest, Spaces4 Comments on Introducing Cowo Milano (Italy). One of the best Kill Bill scenes, hands down, is Beatrix fighting O-Ren Ishii’s Crazy 88s. Slight Uma Thurman in a yellow Bruce Lee jump suit slaughtering Lucy Liu’s murderous Tokyo gang of (nearly) 88 swordsthugs? Only Tarantino could pull that off. In pulling together group88 Coworking, I feel a bit like Beatrix (with a few pounds plus, unfortunately) surrounded by the scary loomingness of potential defeat. Like Beatrix, I have been training for the challenge – learning from other coworker masters, conquering hesitation by coworking in other spots, networking like crazy (possibly 88+ times since last August) and agonizing over my revenge tactics for terminating the pains of solitary confinement for independents in the ‘burbs. I’m sure we’ll have many more challenges on our journey. One out of three people I talk to about coworking, usually respond with “Cowhatting?” Yet, there are tons of solos in our little creative and hopping corner of Connecticut. There is nothing like our space in this area. Will flexible membership, free coffee and a 5-minute walk by Rails to Trails for sushi be enough to bring folks in? Only time will tell. I’m sure we’ll have 88 more challenges ahead, but I’m ready. Yellow jumpsuit not required, but in consideration. so if you’re in the south brooklyn / gowanus area, shoot either one of these two guys an email and see if they start interjecting our most favorite hyphenated/non-hypenated word.